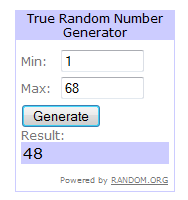 The winner of the Gold prize package did not respond within required 24 hours therefore, a new winner of the H20 Audio and Words to Sweat by giveaway has been selected. Congratulations comment #48, Lisl Windham! .-= Emily´s last blog ..Best wedding video ever =-. .-= Lisl Windham´s last blog ..Dream Big Workout! =-.